^ “Differentiation of monocytes. Origin, nature, and fate of their azurophil granules”. J. Cell Biol. 50: 498–515. (1971). doi:10.1083/jcb.50.2.498. PMC: 2108281. PMID 4107019. https://www.ncbi.nlm.nih.gov/pmc/articles/PMC2108281/. ^ a b Swirski, FK; Nahrendorf, M; Etzrodt, M; Wildgruber, M; Cortez-Retamozo, V; Panizzi, P; Figueiredo, J-L; Kohler, RH et al. (2009). “Identification of Splenic Reservoir Monocytes and Their Deployment to Inflammatory Sites”. Science 325 (5940): 612–616. doi:10.1126/science.1175202. PMC: 2803111. PMID 19644120. https://www.ncbi.nlm.nih.gov/pmc/articles/PMC2803111/. ^ Ziegler-Heitbrock, L (2010). “Nomenclature of monocytes and dendritic cells in blood”. Blood 116 (16): e74–e80. doi:10.1182/blood-2010-02-258558. PMID 20628149. ^ Ziegler-Heitbrock, L (2007). “The CD14+ CD16+ Blood Monocytes: their Role in Infection and Inflammation, Review”. 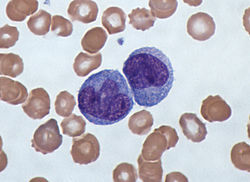 J Leukocyte Biology 81 (3): 584–92. doi:10.1189/jlb.0806510. PMID 17135573. ^ Heine, Gunnar H. (2008). “CD14++CD16+ monocytes but not total monocyte numbers predict cardiovascular events in dialysis patients”. Kidney International 73: 622–629. ^ Rogacev, Kyrill S. (2012). “CD14++CD16+ monocytes independently predict cardiovascular events: a cohort study of 951 patients referred for elective coronary angiography”. J Am Coll Cardiol 60 (16): 1512–1520. doi:10.1016/j.jacc.2012.07.019.